The superpowers he referred to are the deep-pocketed governments of the Soviet Union, the United States and China. So Beresheet also aims to strike a blow for low-cost space exploration; the mission's total price tag, including launch, is about $100 million, project team members have said. The GLXP aimed to help spur private space exploration. The contest ended last year without a winner, but it still succeeded in its primary objective, as SpaceIL's progress to date shows. And several other former GLXP teams, including the American company Moon Express, have continued to develop their spacecraft as well. Beresheet launched to Earth orbit atop a SpaceX Falcon 9 rocket on the night of Feb. 21. The spacecraft performed a series of engine burns over the following six weeks, pushing the farthest reaches of its elliptical orbit closer and closer to the moon. And Thursday, the moon reached out and grabbed Beresheet. The milestone came after a six-minute engine burn, which began at 10:18 a.m. ET. This braking maneuver reduced Beresheet's velocity relative to the moon, allowing lunar gravity to capture the craft, project team members said. "After six weeks in space, we have succeeded in overcoming another critical stage by entering the moon’s gravity," SpaceIL CEO Ido Anteby said in the statement. "We still have a long way until the lunar landing, but I‘m convinced our team will complete the mission to land the first Israeli spacecraft on the moon, making us all proud." The lander will spend the next week lowering and circularizing its orbit and prepping for touchdown, which will occur on the lunar near side's Mare Serenitatis ("Sea of Serenity"). 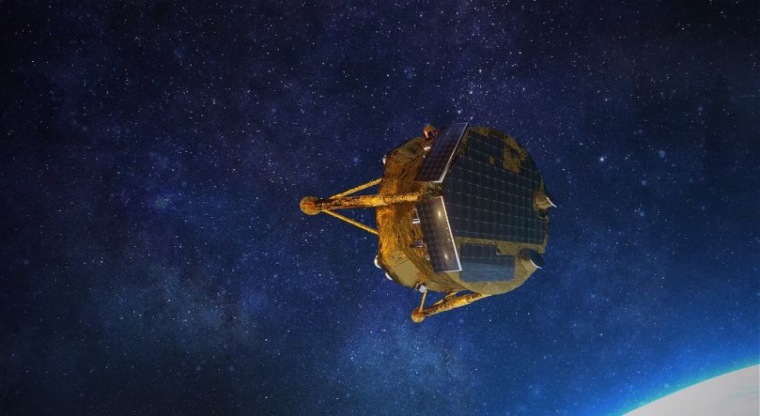 The mission will end shortly after this historic moment; Beresheet is expected to operate for just two or three Earth days on the moon's surface. The lander will gather some data during its time around and on the moon; it will measure local lunar magnetic fields, for example. And Beresheet carries a technology demonstration for NASA — a small laser retroreflector array, which could help future spacecraft perform precision landings on the moon and other celestial bodies. But Beresheet's main goals aren't scientific. The mission aims to advance Israel's space program and to inspire children around the world — but especially in Israel — to care more about science, technology, engineering and math. This outreach work has already begun. SpaceIL personnel have met with more than 1 million Israeli schoolchildren since the nonprofit was created in 2011, mission team members said. And Beresheet's handlers have released photos from Earth orbit showing the lander's Israeli flag in the foreground and its home planet in the background. Beresheet is also helping preserve human culture. The lander carries a time capsule that contains, among things, a "lunar library" put together by the nonprofit Arch Mission Foundation. The library is part of Arch's Billion Year Archive initiative, which stores backups of our species' accumulated knowledge at various locations on and off Earth. "By delivering many copies to many places, and updating them with new installments on an ongoing basis, we intend to gradually pepper the solar system with the records of our civilization," Arch Mission Foundation representatives wrote in a project description. "The more Arch Libraries we deliver into the Billion Year Archive, and [the] more places we store them, the more likely it is that at least some of them will survive for billions of years into the future, when they may eventually be found by those who come after us," they added.